The Knight of Swords is a powerful force that means well. For good or ill, the Knight charges forward into the wind, bearing the sharp sword of Truth (as the Knight sees it) with no regard for the consequences. I’ve seen this character before. 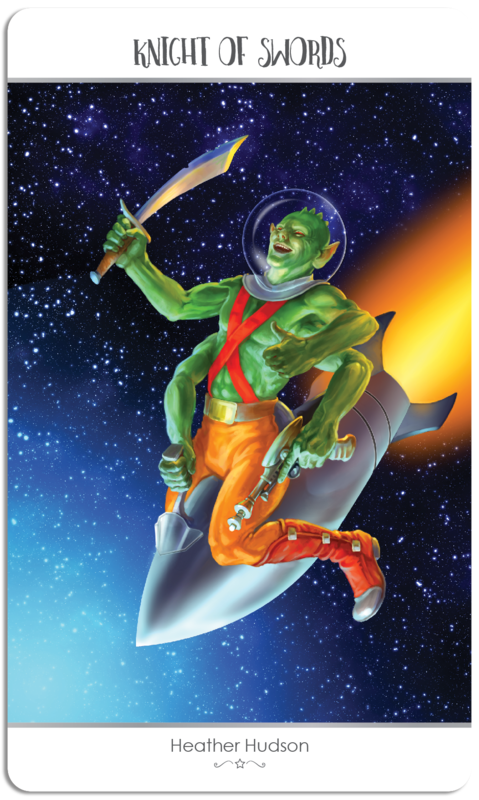 Space opera loves a well-intentioned supporting character who creates chaos by charging into action; today we have Chewbacca the Wookie, Drax the Destroyer and Worf in Star Trek Next Gen, but the tradition goes way back to Green Martian warriors of Barsoom and other archetypal Noble Warriors in Space from the early days of pulp adventure. We need the Knight of Swords – he causes chaos, but he also moves the action forward. The card does not indicate comfort, but it does predict that stuck things will be jolted free and stuck people will be shoved into action. And sometimes that’s a good thing. When this card appears in a reading, it’s recommending asking yourself a few questions before acting. You know what you want to do, and how you need to do it. You’re determined and confident, knowing your motives are beyond reproach. But is it coming across that way? In your logical, assured approach, do you seem a bit arrogant? Are you rushing in? Would it help if you took the time to explain what you’re doing? Have you stopped to consider the consequences? The Knight of Swords can represent an intelligent, authoritative figure who is currently in your life, or coming into it soon. Someone who uses logic and analysis to find solutions to problems, but who lacks understanding of the human spirit. Sometimes this obliviousness comes across as superiority or tactlessness, but it’s not usually meant. This entry was posted in Artist, Deck Review, Featured Card of the Day, General Tarot, Readings and tagged 78 Tarot, Astral, Knight of Swords, Tarot.